In September 2017 the Pharmacists’ Defence Association (PDA) announced that they would donate £1 from the membership fee of every single member (students and trainees included) to the profession’s charity. In the first year of this partnership (Sept 2017 – 2018), this generated a donation of over £29,000, enabling the charity to provide its much needed free and confidential support to those in the profession facing challenging times. 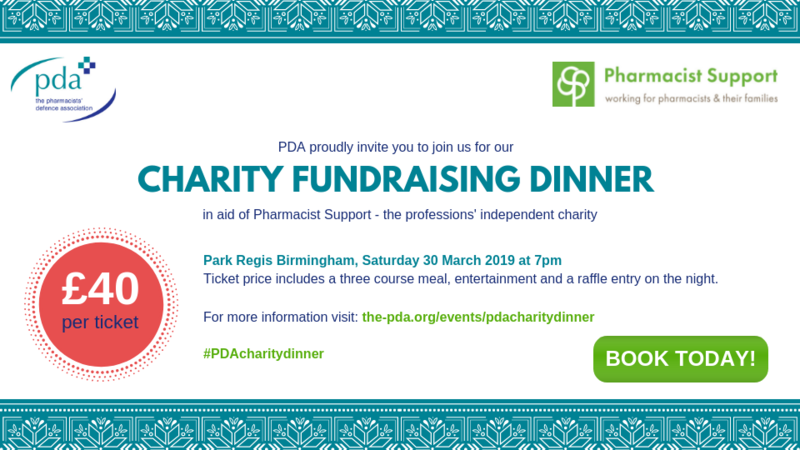 In 2019 the PDA are furthering their commitment to supporting Pharmacist Support, and are hosting a fundraising dinner at the Park Regis Hotel in Birmingham on Saturday 30th March as part of their National Conference. Tickets for the dinner cost £40 per person and include a tjree-course meal, entertainment and a raffle entry. Attendees will also get the opportunity to win more fabulous prizes on the night! The dinner will not only raise much needed funds for a great cause, it promises to be great night for all in attendance. Click here to book your place. The Charity Dinner will be held on the first evening of the PDA National Conference, which takes place in Birmingham on 30 – 31 March 2019 at the Park Regis Hotel. The conference is open to anyone who has an interest in the future of pharmacy or pharmacists. It will provide attendees with information on emerging opportunities and practical guidance on effectively managing risk as well as the opportunity to engage and connect with others in the sector. The 2-day programme will include sessions from renowned national and international speakers as well as an update on the work of the PDA.